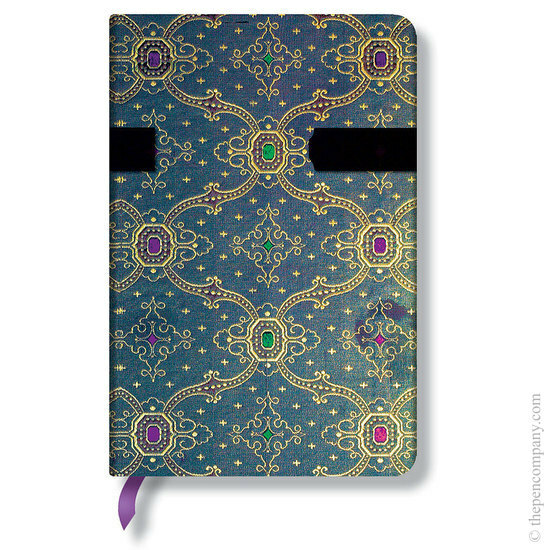 The wrap journals in the French Ornate style are as unique as they are beautiful. Each cover combines a range of tones that bring alive a richness that is enticing to both sight and touch. The classic colours are complemented by an elegant curved wrap, ribbon markers and the eternally useful memento pouch. Exactingly printed to recreate the luminosity and look of classic era silk, our journals in shades of olive green and alluring blue are dedicated to the beautiful fabrics of the Jacquard loom silk weaving tradition. The bright jewel design of these midi notes is perfect for writers who like to work in style.